We arrived in Florence via super fast train from Rome. It’s hard to believe how quickly you can get from one city to the next. It’s something I love about Italy – everywhere feels close. We made our way from the station on foot to a gorgeous Air BnB apartment we booked. This time we were staying in the apartment on our own. We were greeted warmly by our host Jacopo (after ascending the many flights of stairs to the fourth floor) and shown around. In typical Italian style, we had beautiful big windows with shutters that open out onto the street. The place was really nicely decorated – my favourite part, Jacopo’s black and white photography which hung from the walls. He said it is a hobby, but I think he may have been a little modest. The area we were staying in was South of the river, quite close to the Ponte Vecchio and our favourite – Piazza Santo Spirito. It is a little less touristy than other places, which we really enjoyed. We really felt like we were living like locals on a number of occasions. I would definitely recommend this as an option if you are in Florence. Everything you would want to see was still pretty much in walking distance, yet most of the time you’ll be still kicking it with Italians. Our first day we had a bit of a wander to orient ourselves with the area. We headed to the Ponte Vecchio with its long line of (expensive) jewellery stores, watched the sunset over the bridge and had dinner and a drink at Piazza Santo Spirito – our first of many. The Piazza, no matter what time or what day, was always abuzz with action. Couples having dinner, friends hanging out and drinking at one of the bars (or just bringing their own and sitting on the steps), people walking dogs, children playing in the fountain. It was so lively and vibrant, it’s no wonder we spent a lot of time there. Another welcome change (particularly compared to Rome), was it had some lovely big trees providing welcome shade in the hot weather. The heat wave we’d experienced in Rome had continued to Florence. One night in the square a band was playing a concert of gypsy-like music. Right down our alley. There were a number of people dancing, led by an older (slightly portly) italian man. He was having a great time. I’m not sure what people were more excited about, the music or his terrible, yet incredibly amusing moves. 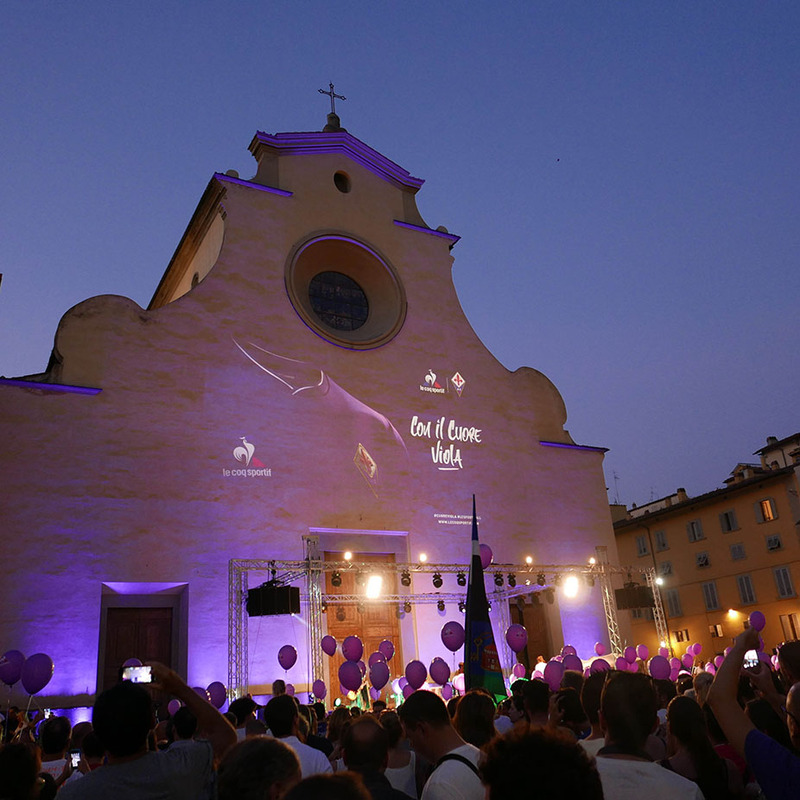 Another night the Piazza was taken over by a sea of purple and white – as the local football (soccer) team, Fiorentina, celebrated their new partnerships with Le Coq Sportif and revealed the season jumper. Complete with bands, DJ and exuberant fans singing the club themes song – it was a fun night. We also met a really interesting guy – Adetomiwa Gbadeb. He was visiting florence for an artist residency. Originally from Nigeria, Adetomiwa was in Florence to fly the flag of contemporary African art – quite the juxtoposition against the backdrop of Florentine history. 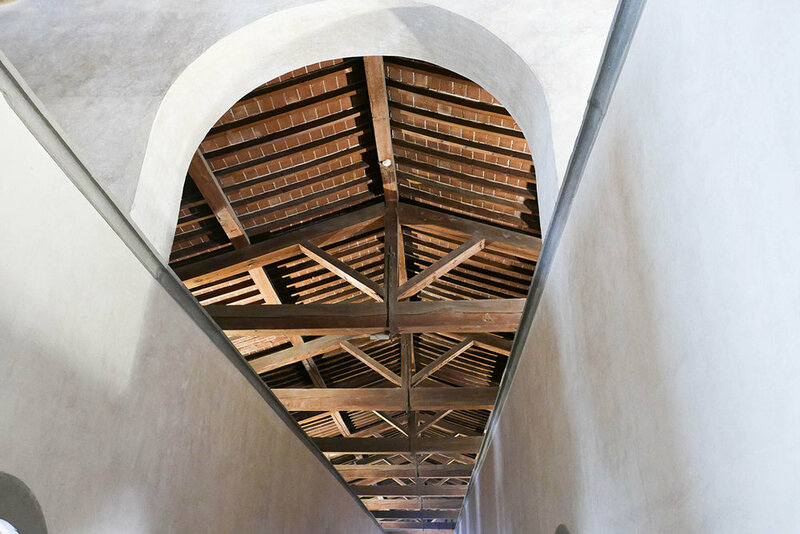 There is so much to see and do in Florence. It reminded me a lot of Kyoto in that you could go 20 times, not see everything and still want to come back. We headed to most of the main attractions: The Uffizi Gallery, Palazzo Vecchio, Academia, San Lorenzo Market, Pitti Palace, Bolboli Gardens and Michelangelo Piazza. 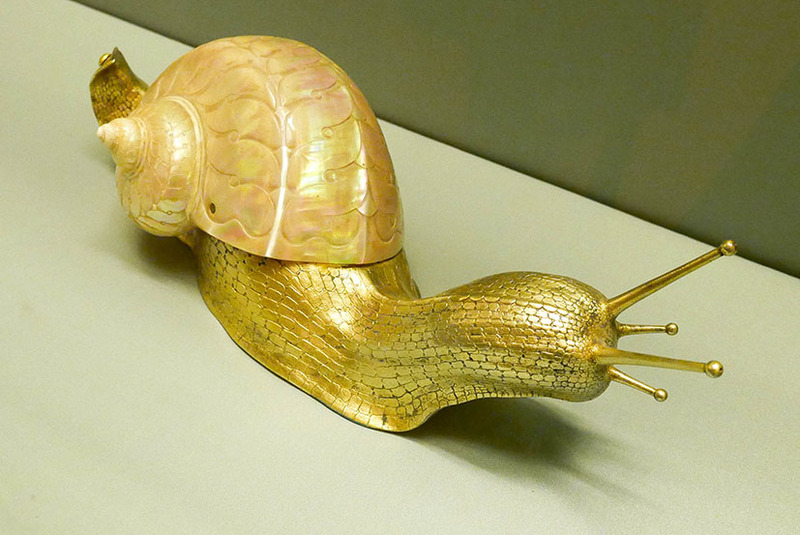 As well as a few of the lesser known ones: San Marco and Gallileo Museums. Our first full day was the Uffizi Gallery, Palazzo Vecchio, and Academia. We were super lucky in that on the first Sunday of every month Uffizi and Academia are free. We couldn’t believe our luck. If you are in Florence and you don’t happen to be there at this time, I’d recommend buying a Friends of the Uffizi pass, but beware – they are not always open so you need to make sure you’re organised to get this in time to make use of it for your trip – particularly if you’re not in Florence for long. We learned this from experience, it was just luck we ended up getting two of the main attractions free. The Uffizi is pretty spectacular (as is everything in Florence). The breadth of the art is really fantastic. If you’re heading there, I’d recommend downloading Rick Steve’s app, which gives you a guided tour through the museum at your own pace. Easily as good as any guide or tour. My favourite in the museum would have to have been Bottecelli – particularly the Birth of Venus and Primavera. It’s funny, I’ve seen these before in books or TV etc and never thought much of them, but in real life they really took my breath away. Botticelli really has this amazing way of capturing beauty and a certain mystique. For the Palazzo Vecchio we downloaded the guide on the museum app. Which again was well worth the $6.49 on iTunes. Being able to go through this enormous, elaborate attraction at your own pace, was fantastic. There is so much you would not even notice if you didn’t have a guide – so I would say it is a must. Just make sure you download all the videos before hand. Although if you don’t – there is amazing free wifi (Firenze Free WIFI) which you can tap into at most the main attractions in Florence. 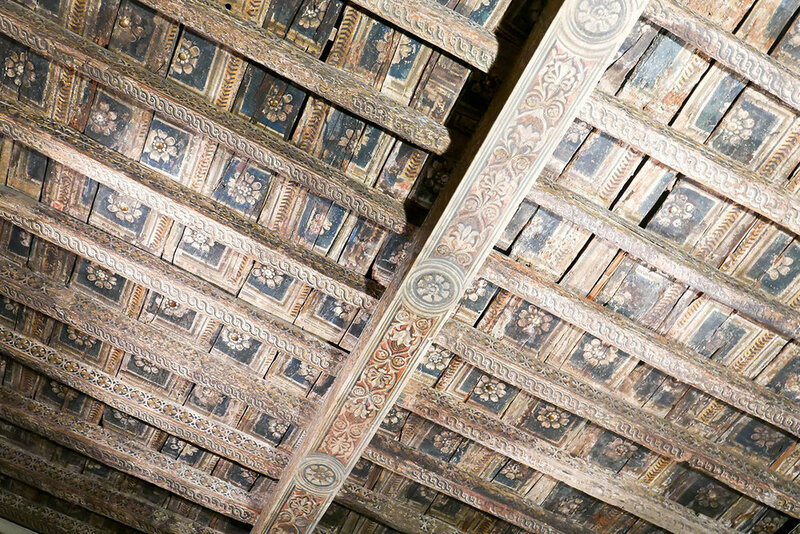 Detailed paintings decorated many of the walls and ceilings – each with their own unique story. Our favourite room was the wardrobe/map room. Intricate maps decorated panels on every wall – which we learned were actually wardrobes where the Medici family would store precious objects. A trip to Florence would also not be complete without seeing Michelangelo’s David at the Academia. 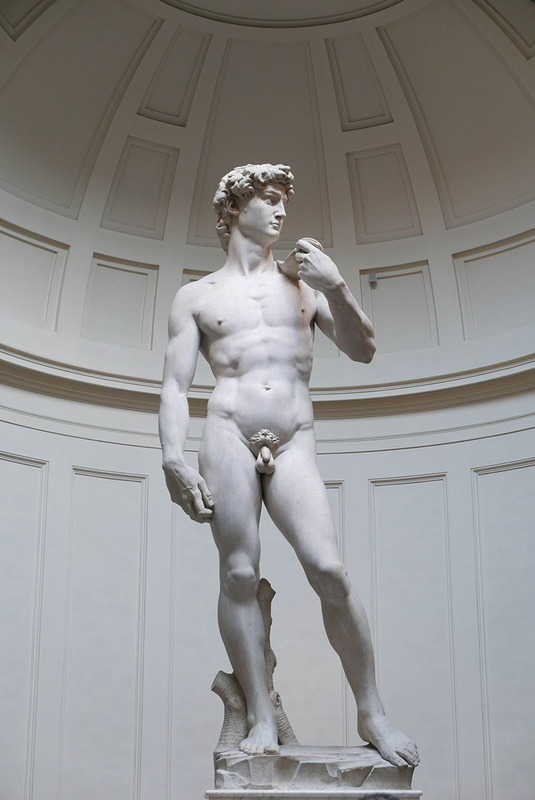 Moved from it’s original position outside the Ponte Vecchio (where a copy now stands in its place), I was not that excited about seeing David in the flesh. I was surprisingly impressed however. There is something really intriguing about him. Again Rick Steves filled us in on what to look out for. 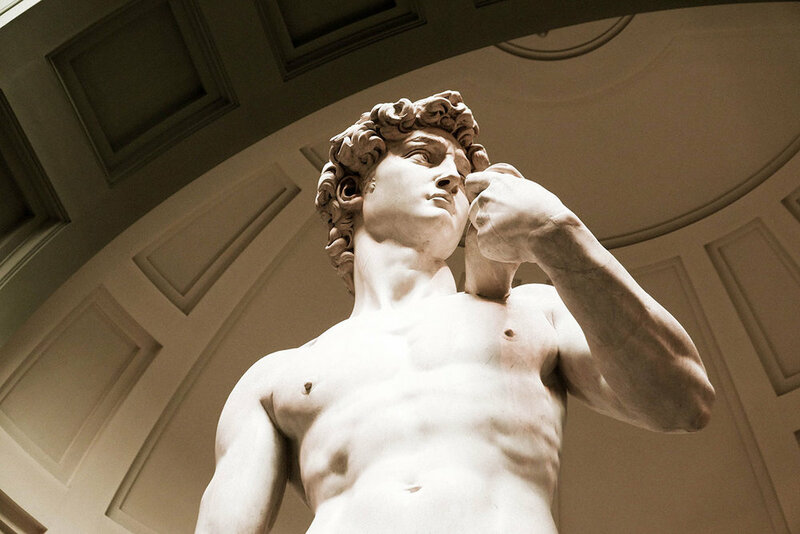 He points out that from the front David looks sure of himself – ready to slay the giant, but from the side you can see the slight hesitation in his eyes. It’s amazing what Michelangelo managed to do with a big hunk of marble (which apparently other artists had rejected). 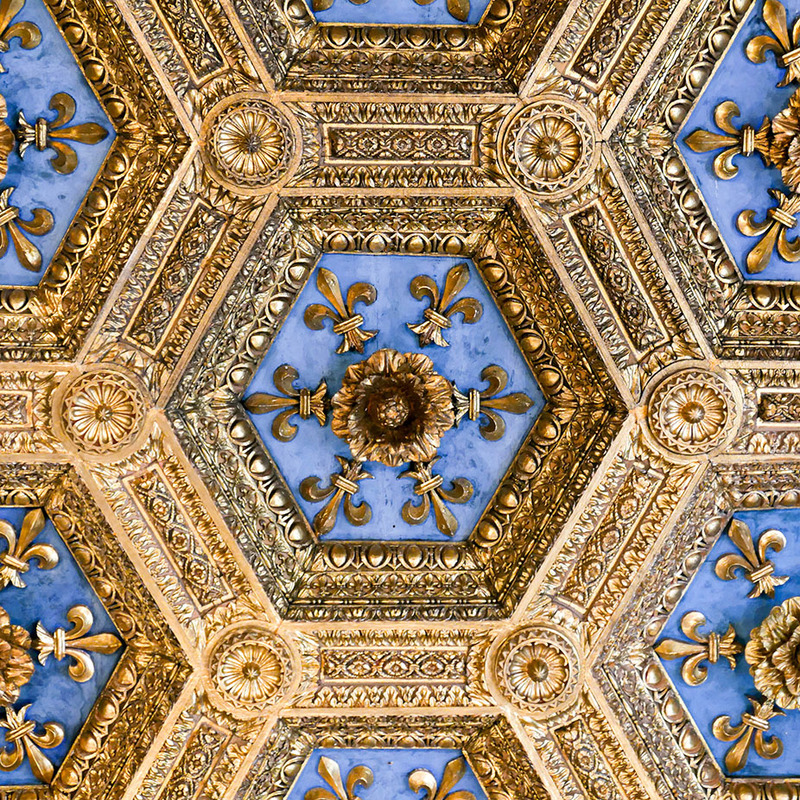 The Pitti Palace – with its elaborately decorated rooms. On this ticket you also get the Modern Art gallery, Palatine Gallery and in our case a Carlo Dolci exhibition, which was absolutely stunning. 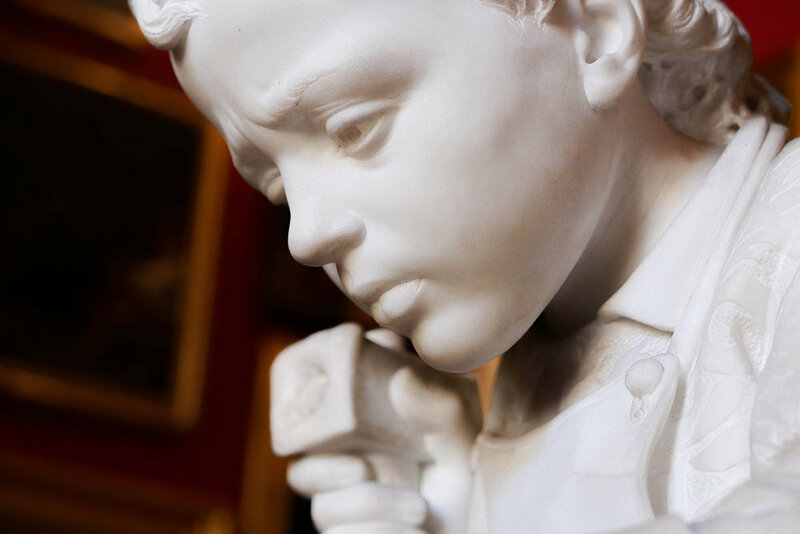 Some of the artists included Raphael, Rubens, Caravaggio, Donatello just to name a few. 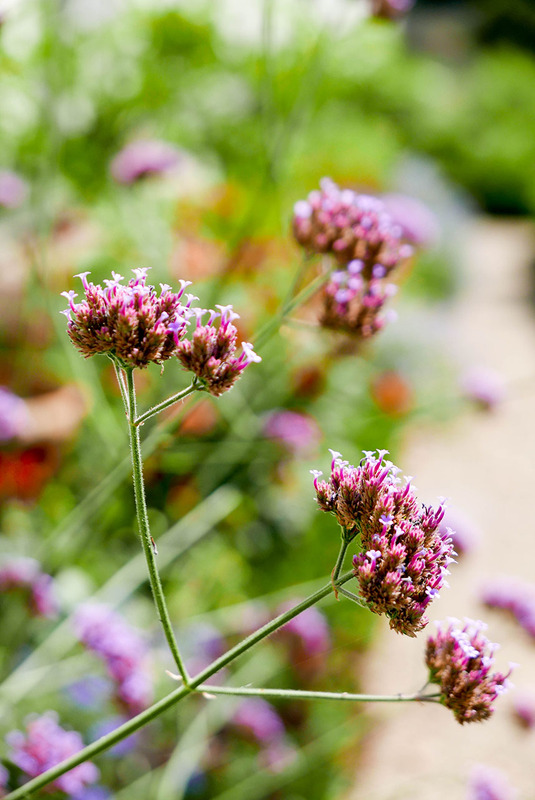 Bolboli Gardens – These lovely gardens go on for miles and were a welcome change form the heat and built up environments of both Florence and Rome. The best part of this was walking through a flower garden and stumbling across what we we thought at the time was a hummingbird. We spent about 15 minutes racing around the garden after it trying to get a great shot (which we did). 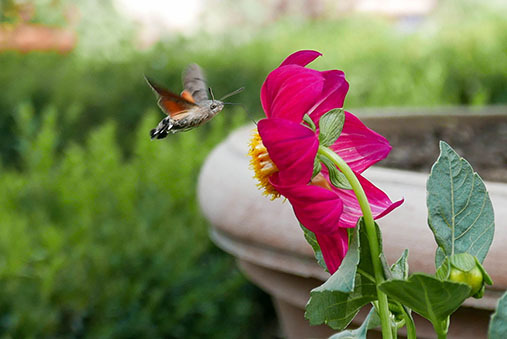 We later Googled it and learned it was not in fact a hummingbird, but a Hummingbird Hawk Moth. Yes. Such a thing exists. We were slightly disappointed, but it was still pretty fascinating. On the same ticket we were also able to see the Costume gallery and one of my favourites, the Treasures gallery. 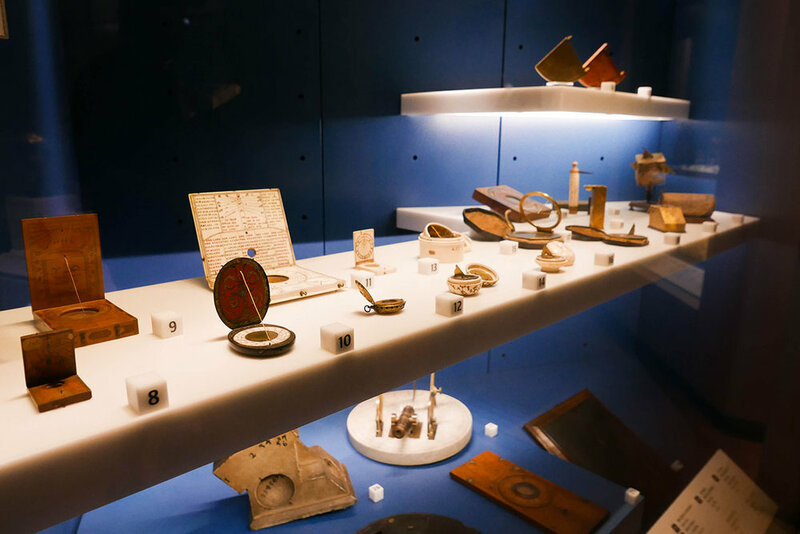 It was full of amazing pieces of jewellery and trinkets including an exhibition on Lapis Lazuli – a bright blue metamorphic rock used in decorating jewellery and other objects. 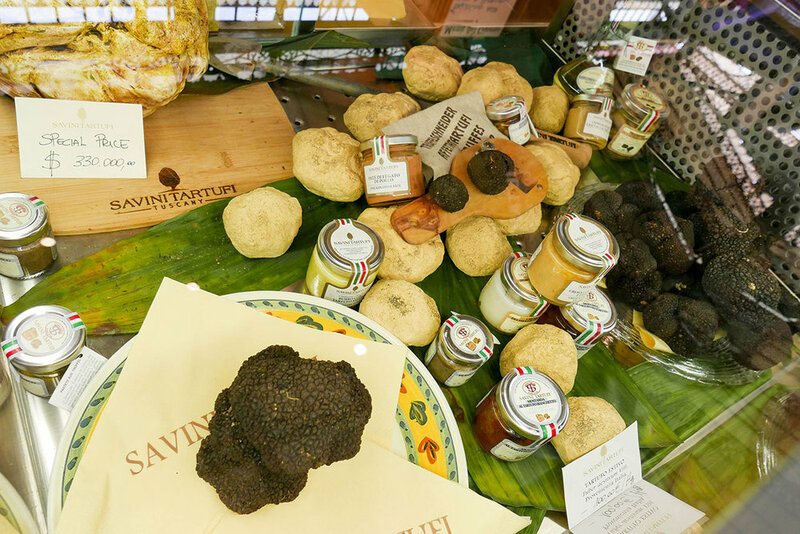 San Lorenzo Market – A beautiful indoor food market filled with all the meats, cheeses, fruit and vegetables, oils and spices you could imagine. 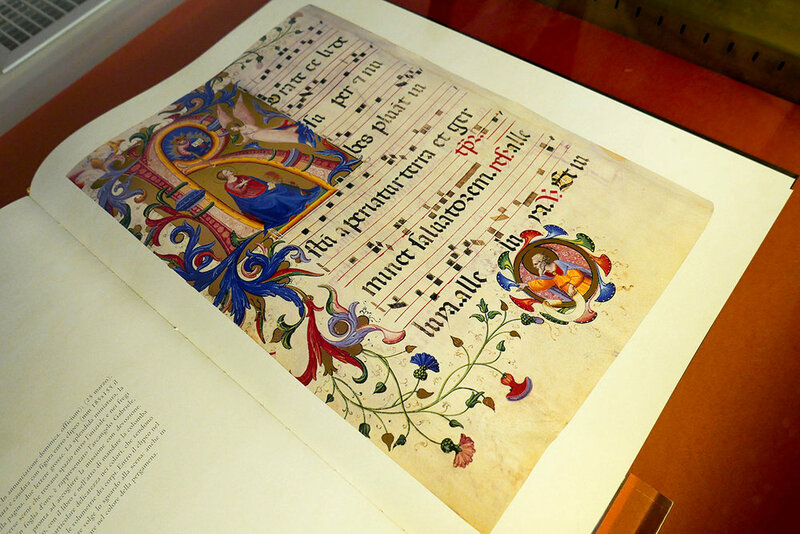 San Marco Museum – An ex monsestary with beautiful frescos on pretty much every wall and a very interesting exhibit of ancient books – complete with intricate lettering. 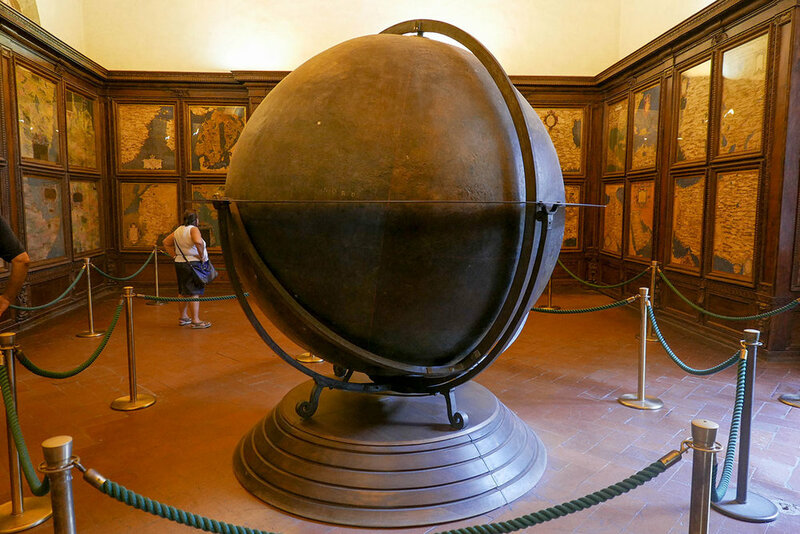 The Galileo Museum – A nice change of pace from all the art. 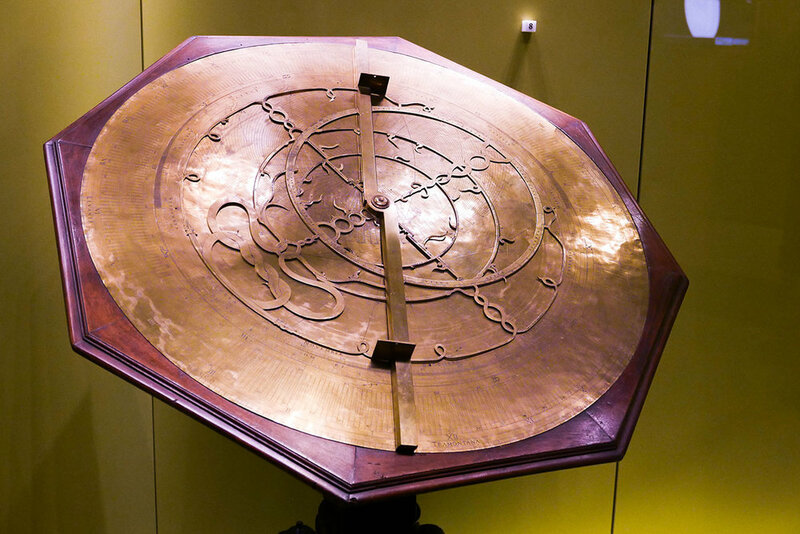 This museum houses hundreds of scientific instruments, globes, navigation instruments and so much more. Definitely check this out if you get a chance, it’s fascinating and really well set up (also nice and cool on a hot day). Michelangelo Piazza – This is a square at the top of a hill overlooking Florence. If you’re up for a bit of a climb you can head up in the evening for an amazing view of the city. Going up at sunset makes it extra spectacular and you can enjoy a cheap drink from a stall (or BYO). While we were up there on our last night we also happened to stumble across what I think was some kind of spin class marathon. Picture 200-300 Italians on exercise bikes, sweating it out in the heat in unison to bad electronic music with a backdrop of historical Florence at sunset (including another replica David). 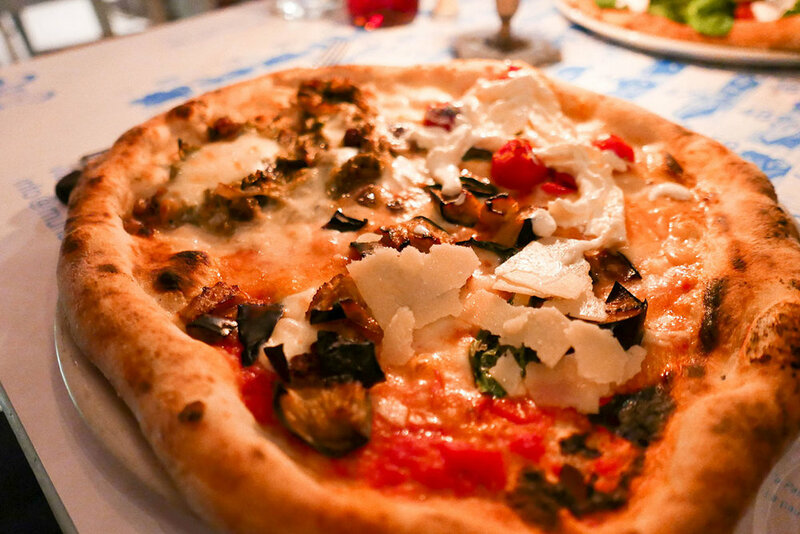 Osteria Santo Spirito – we checked this place out a recommendation from Tim’s Mum. It did not disappoint. Particualy the bacon wrapped mozzarella, the cheese and truffle gnocchi and the pepperoncino. Munaciello (Muna)- Great pizza, but also THE BEST lemon gelato I’ve ever tasted. Very lemony. Your local supermarket – Grab some sliced meat, soft cheese, tomato, mozzarella, roll or bread, antipasto and make yourself up a tasty lunch – you’ll save some coin and it’s just as good as any Panini place (if not better). Pretty much anywhere in Florence – Have a Negroni or an Aperol Spritz. Very refreshing after a long day of walking. And long days of walking we had many. By the end of the 6 days our feet were very hot and tired. My Mum told me to be sure to wear comfortable shoes – she was not wrong. The cobblestones really do make it hard on the body if you are walkers like we are. Make sure if you are here you do take a little down time. We had a few afternoons of just hanging out and doing nothing much. Well needed when there is so very, very much to see.